As Low as with Affirm. Lowest Price Guranteed! * Read More! We offer the best products at the best price available on every item in our store. All prices are listed in U.S. dollars. 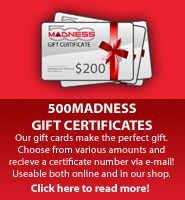 Orders placed at 500madness.com will be charged in U.S. dollars. If you live outside the U.S., this charge is converted by your bank into your local currency and should appear on your credit card statement in that currency. We will match the published price of any US supplier* -- even their current sales prices! If you find an item advertised at a lower price, make a notation in your online order, call or email us at 500madness@gmail.com with your price match request (see terms and details below). We'll sell you the SAME item at the SAME price! If you've already purchased the item from us, we'll even price match (for store credit only) as long as you contact us with your request within 7 days of placing your order. 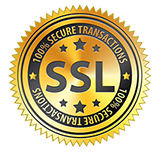 This offer is restricted to identical items offered for sale in writing or on the web. When making your price match request, you must provide us with a link to the competitor's Internet URL for the item, a copy of the written ad or written quotation, which must include Supplier's’ part number, description and price. • The competitor's product is not an exact match (identical manufacturer & model) with ours. • The competitor with the lower price does not have the item in stock at their warehouse. • The competitor's total price (including shipping, handling, taxes, etc.) is higher. • The competitor's product is used, refurbished, reconditioned, or a display model. • The competitor is not selling in US dollars. • The product is a clearance or closeout item. • The item is not found within the first 10 items listed on major search engine results. • The competitor is not manufacturer authorized or has advertised below the manufacturers minimum allowed price for the item. • Qualified U.S. Suppliers are established businesses that routinely and regularly sell the item to be matched from an established physical storefront or warehouse. While we endlessly aim to maintain the accuracy of item availability, descriptions and availability, we reserve the right to correct errors. We reserve the right to choose not to honor this offer. Please send a separate email with the subject header of PRICE MATCH REQUEST. Provide the competitor's name, part number, item description, URL link to the exact item and the competitor's price along with your request to price match. If we agree to match the price, you will be contacted with a confirmation and directions on how to place your order for the price request. In the event we cannot match the price, we will notify you by email. Alternatively, you may call us with your request. We'd love to talk with you. We generally respond to price match requests within one business day. Please select your desired amount and confirm your addition to your cart. In order to reduce errors in orders, please make sure the product you are ordering fits your vehicle model. and get assistance from one of our sales team members! ORDERING 3 OR MORE ITEMS? Call us for a shipping discount! 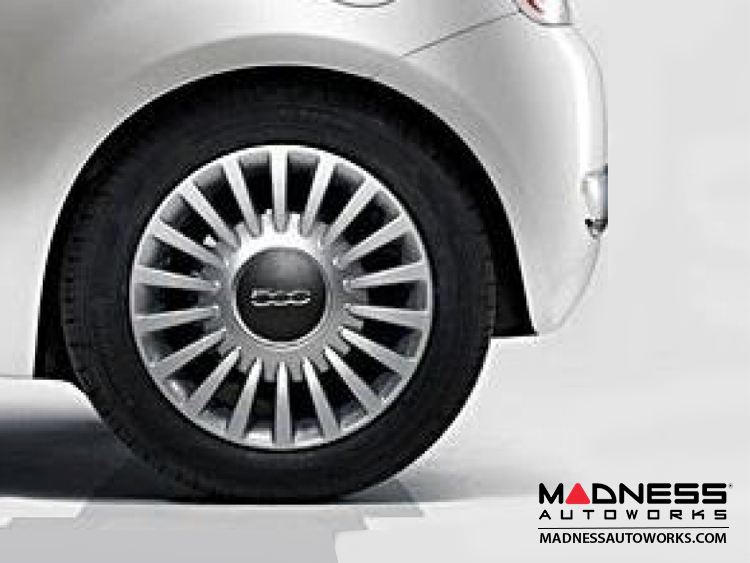 Need a spare FIAT 500 Lounge Wheel? 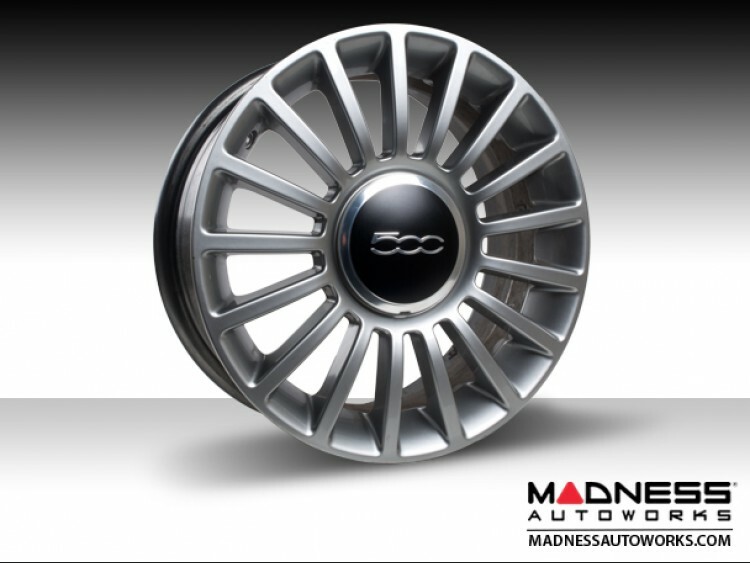 This listing is for one "Take Off" Lounge Wheel that originally came off a FIAT 500 Lounge that we customized. Wheel may have small imperfections that are in line with being take off (used) parts. This listing is for the wheel (1) only. Center Caps are extra and not included in this listing. Please check our other listings for caps, sensors and tires. This listing is for "Take Off" wheels. 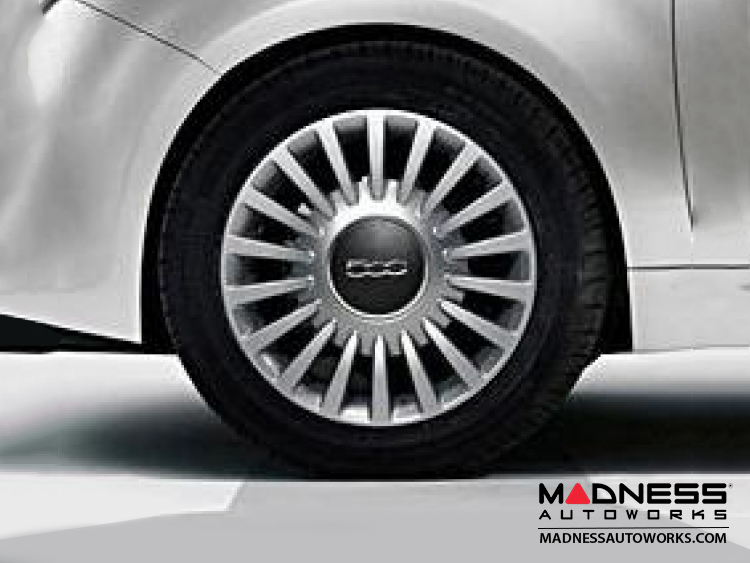 This means the wheels have been previously used, but are in great condition. The wheels have been wiped down, but "may" still have a little bit of road grime on it. 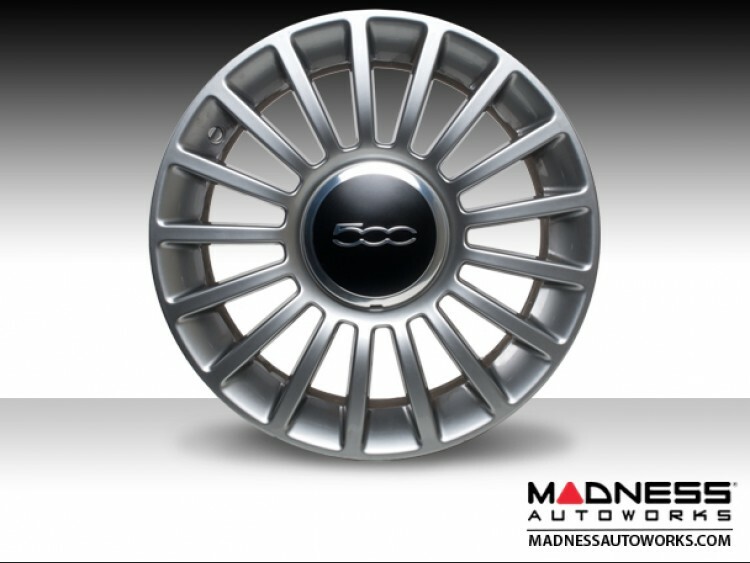 FIAT 500 Wheels (4) - Pop Steel "Take Off"
FIAT 500 Wheel (1) - Pop Steel "Take Off"
FIAT 500 Wheel (1) - Sport "Take Off"
FIAT 500 Wheel (1) - ABARTH "Take Off" (V4) - 16"
FIAT 500 Wheels (4) - Sport Prima Edizione Model "Take Off"
FIAT 500 Engine Cover - OEM - "Take Off"
FIAT 500 Wheels (4) - Sport "Take Off"
FIAT 500 Air Bag - OEM - "Take Off"
FIAT 500e Wheel (1) - "Take Off"
FIAT 500e Wheel - "Take Off"
FIAT 500 Windshield Wiper Assembly and Motor - "Take Off"
FIAT 500 Rear Windshield Wiper Motor - "Take Off"
FIAT 500 ABARTH Engine Cover - OEM - "Take Off"
We are not affiliated with Chrysler Group LLC, Fiat Group Automobiles S.p.A, or any of their U.S. or other affiliates in any way. Any references herein to vehicles or parts manufactured, distributed, or sold by them are done only to identify those vehicles for which we provide aftermarket parts or services or parts that we resell for aftermarket purposes. 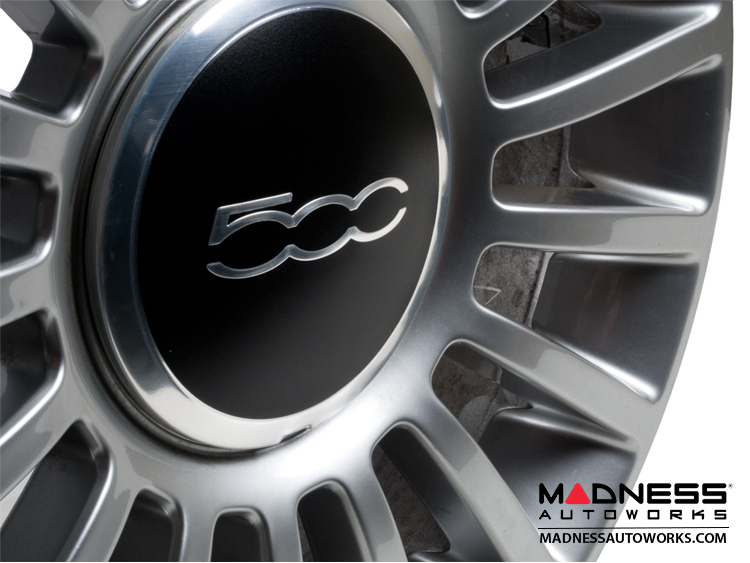 We are not licensed to use any trademarks or service marks owned by Chrysler or Fiat or any of their affiliates.